PowerApps apps use role-based security for sharing. The fundamental concept in role-based security is that a security role contains privileges that define a set of actions that can be performed within the app. All app users must be assigned to one or more predefined or custom roles. Or, roles can also be assigned to teams. When a user or team is assigned to one of these roles, the person or team members are granted the set of privileges associated with that role. To share an app you must have the PowerApps Environment Admin or System Admin role. The topic will follow the company, Contoso, which has a pet grooming business that services dogs and cats. An app that contains a custom entity for tracking the pet grooming business has already been created and published. Now the app must be shared so that the pet grooming staff can use it. To share the app, an administrator or app maker assigns one or more security roles to users and to the app. The PowerApps environment includes predefined security roles that reflect common user tasks with access levels defined to match the security best-practice goal of providing access to the minimum amount of business data required to use the app. Remember that the Contoso pet grooming app is based on a custom entity. Because the entity is custom, privileges must be explicitly specified before users may work in it. To do this, you can choose to do one of the following. Expand an existing predefined security role, so that it includes privileges on records based on the custom entity. Create a custom security role for the purpose of managing privileges for users of the app. Because the environment that will maintain the pet grooming records is also used for other apps that the Contoso business runs, a custom security role specific to the pet grooming app will be created. Additionally, two different sets of access privileges are required. Pet grooming technicians only need to read, update, and attach other records so their security role will have read, write, and append privileges. Pet grooming schedulers need all the privileges that pet grooming technicians have, plus the ability to create, append to, delete, and share, so their security role will have create, read, write, append, delete, assign, append to, and share privileges. 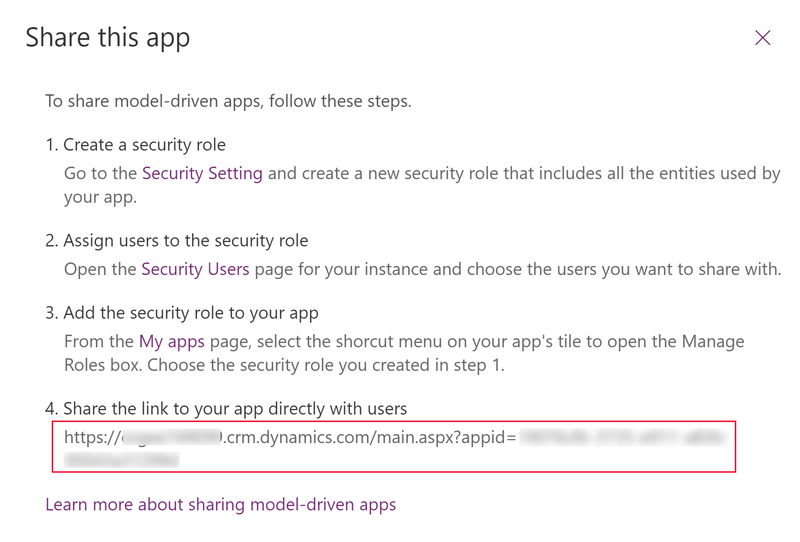 On the PowerApps site, select Apps > …> Share link. From the Share this app dialog, under Create a security role select Security Setting. On the Settings page, select New. From the security role designer, you select the actions, such as read, write, or delete, and the scope for performing that action. Scope determines how deep or high within the environments hierarchy the user can perform a particular action. In the Role Name box enter Pet Grooming Technicians. Select the Custom Entities tab, and then locate the custom entity that you want. For this example, the custom entity named Pet is used. Because the pet grooming app also has a relationship with the account entity, select the Core Records tab, and on the Account row select Read four times until organization scope global has been selected. Select the Customization tab, and then in the privileges list select the Read privilege next to Model-driven App so that organization scope is selected. On the security role designer, in the Role Name box enter Pet Grooming Schedulers. Select the Custom Entities tab, and then locate the Pet entity. From the Share this app dialog, under Assign users to the security role select Security Users. In the list that is displayed, select the pet groomers. In the Manage User Roles dialog box, select the Pet Grooming Technicians security role that you created earlier, and then select OK.
From the Share this app dialog, under Assign users to a security role select Security Users. In the list that is displayed, select the pet grooming schedulers. In the Manage User Roles dialog box, select the Pet Grooming Schedulers security role that you created earlier, and then select OK.
Next, one or more security roles need to be assigned to the app. Users will have access to apps based on the security roles they're assigned to. From the Share this app dialog box, under Add the security role to your app select My Apps. 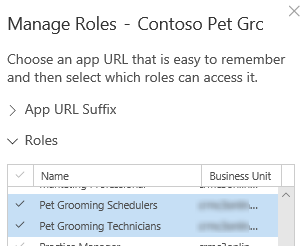 In the lower-right corner of the app tile of the Contoso Pet Grooming app, select More options (...), and then select Manage Roles. In the Roles section, you can choose whether to give app access to all security roles or selected roles. Select the Pet Grooming Schedulers and Pet Grooming Technicians roles you created earlier. From the Share this app dialog box, under Share the link to your app directly with users copy the URL that is displayed. 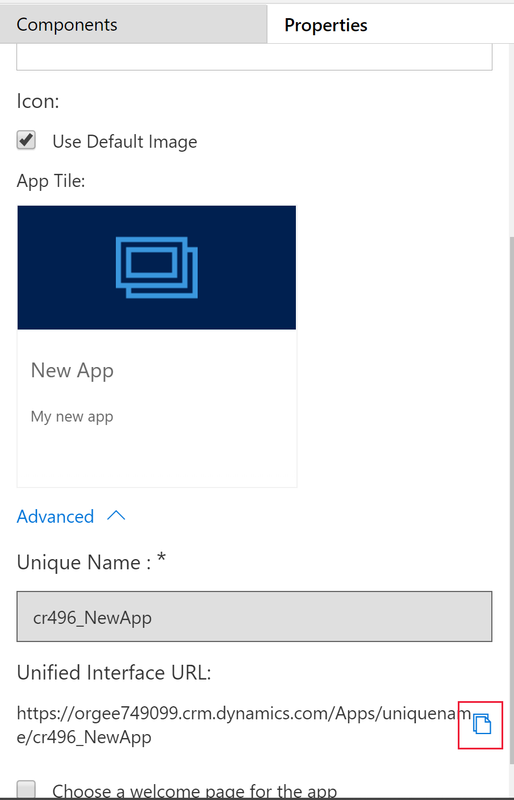 Paste the app URL in a location so that your users can access it, such as by posting it on a SharePoint site or send via email. You can also find the app URL on the Properties tab in app designer. These predefined roles are available with a PowerApps environment. Common Data Service User Read, Create (self), write (self), delete (self) Can run an app within the environment and perform common tasks for the records that they own.